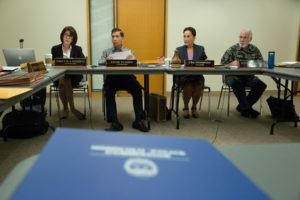 Susan Ballard is sworn in as Honolulu’s police chief to a chorus of praise as the department looks to move beyond the Louis Kealoha years. 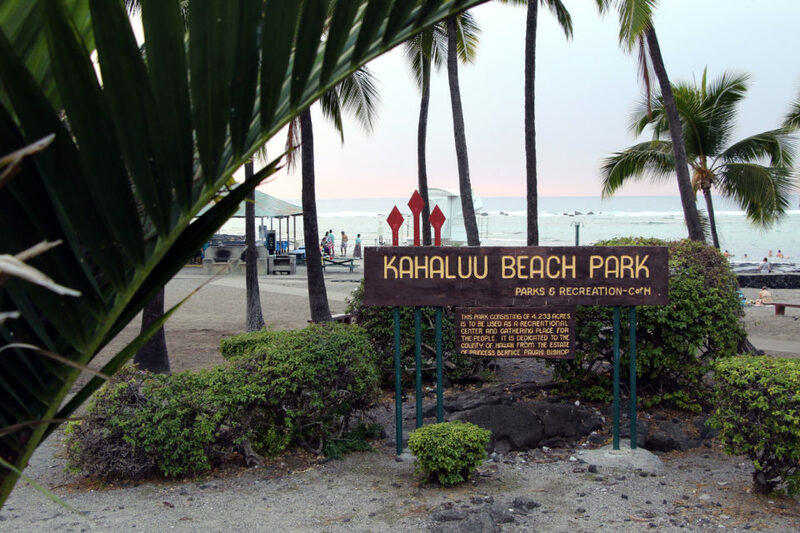 One morning in December 2008, after weeks of heavy rain, the Kapakani Stream spilled over its banks and flooded a section of Waipahu Depot Street, just outside of the Honolulu police academy. About 30 cars on the street were submerged under as much as 4 feet of murky water. New recruits at Ke Kula Makai jumped into the water and began pushing the cars to higher ground. Susan Ballard, then the academy commander, soon joined in while most of the other instructors watched. Ballard and the recruits managed to salvage only a few cars, but Officer William Tamamoto, a recruit at the time, says the episode illustrates Ballard’s character. Honolulu’s new police chief will be tasked with restoring the public’s trust in the Police Department. On Wednesday, Tamamoto and dozens of other officers packed a conference room in the Honolulu Police Department‘s downtown headquarters, cheering and congratulating Ballard as she was sworn in as the city’s 11th police chief. In essence, she’s now being asked to salvage the entire department. Ballard was the unanimous choice of the commission to lead HPD amid a corruption scandal that so far has led to federal charges filed against former Chief Louis Kealoha, his prosecutor wife and five HPD officers. Tenari Maafala, president of the State of Hawaii Organization of Police Officers, says the turnout at the swearing-in ceremony is a sign that Ballard has the backing of HPD’s rank-and-file officers. “We’re really excited for her and looking forward to a good partnership going forward,” Maafala said. Sgt. Cory Gibson, who has worked under Ballard in three different divisions, says she’s the right person at the right time. The avalanche of optimism was impressive, perhaps even cathartic for HPD. No one was talking about the fact that there was a similar outpouring of support for Kealoha when he became chief in 2009. And while two of the police commissioners who selected Ballard acknowledged they were aware of an unresolved lawsuit alleging improprieties during her time at the police academy, they said nothing in the suit dissuaded them from wholeheartedly supporting her promotion. A Virginia native who grew up in North Carolina, Ballard, 60, joined HPD in 1985, shortly after moving to Hawaii with a master’s degree in health and physical education from Tennessee Tech University. Ballard steadily worked her way up, rising to the rank of major in 2001. Retired Chief Lee Donohue, who promoted Ballard to major, says he was impressed by her leadership qualities. 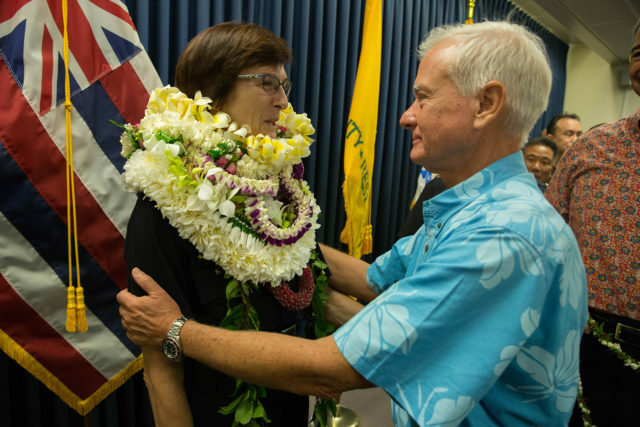 Honolulu Mayor Kirk Caldwell congratulates new Police Chief Susan Ballard on Wednesday. As a major, Ballard was first put in charge of the Finance Division, where she learned the intricacies of HPD’s budget. She went on to oversee five other divisions — including stints as the commander of two patrolling districts in Kalihi and Windward Oahu. Along the way, Ballard earned a reputation as a thoughtful, even-tempered boss, a Bikram yoga devotee who is decisive but humble enough to listen to her subordinates. Ardren, who has worked with Ballard in two different districts, says what stands out for him is Ballard’s fair-mindedness. 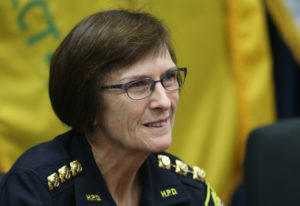 Ballard herself has pointed out that her 32-year experience at HPD makes her a known quantity — a factor that she said will make for a smooth transition. “I think most of the officers have worked with me at some point in time,” Ballard said after her selection was announced last week. “I think any of them … will pretty much tell you that I haven’t really changed since I was a footman — or foot officer. For Ballard, the first order of business — and perhaps the most daunting task — is clear: to restore the public’s trust in HPD, which is still reeling from allegations of abuse of power and corruption during Kealoha’s tenure. On Wednesday, Ballard said her top priority is to make HPD “great again,” but offered few specifics on what she plans to do. But Ballard has highlighted her bona fides as a reformer by pointing that she has called out Kealoha on his propensity for favoritism. Retired Chief Louis Kealoha and his wife, Katherine, exit U.S. District Court in Honolulu after they were arrested on federal charges. 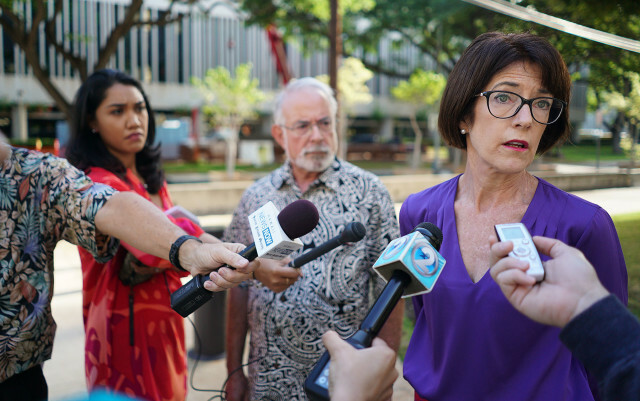 “People shouldn’t be promoted because they’re your friends; they should be promoted for their competency,” Ballard told reporters last week, characterizing herself as having been “basically marginalized” by Kealoha for speaking out. Ardren says he can vouch for Ballard’s outspokenness. Nanci Kreidman, chief executive officer of the Domestic Violence Action Center, is also hopeful that Ballard — the first woman to take helm of HPD in its 85-year history — will do more than her predecessors to address domestic violence issues. One person who didn’t join the chorus of praise for Ballard was Honolulu attorney Carl Varady. He noted that during her tenure at the police academy, she and other officials were accused of altering test scores of some recruits to help fill HPD’s persistent vacancies. In 2009, Varady filed a federal lawsuit on behalf of Deeann Koanui, then an HPD sergeant, alleging that she faced retaliation and harassment for reporting the altered test scores to the Internal Affairs Division. “My client was punished for revealing the fact that officers who could not fulfill the requirements to become a sworn officer were nevertheless passed, and the standards were ignored,” Varady said. Commissioners Steven Levinson and Loretta Sheehan said they were aware of the lawsuit related to Ballard’s time at the police academy, but they still think she’s the right person for the job. “Punishing somebody for enforcing the department’s own standards seems to me to be the epitome of what’s wrong with the department now — that is, department managers think they’re above the law and think that the rules don’t apply to them. 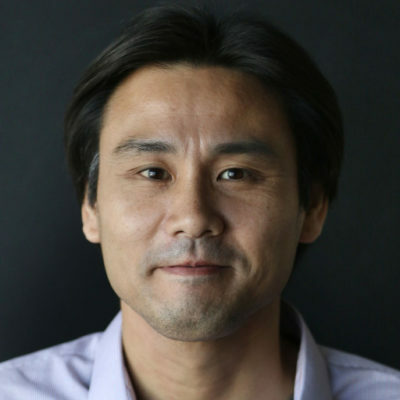 That doesn’t seem to me to be the kind of leadership this department needs,” Varady said. Police commissioners Loretta Sheehan and Steven Levinson say they were well aware of Koanui’s lawsuit during the selection process, but still voted to promote Ballard. Sheehan points out that, even though it’s been pending for eight years, the lawsuit has made little progress in court, and Koanui has yet to provide any proof that the test scores were altered. Levinson says that the lawsuit didn’t change the fact that Ballard was the strongest candidate. 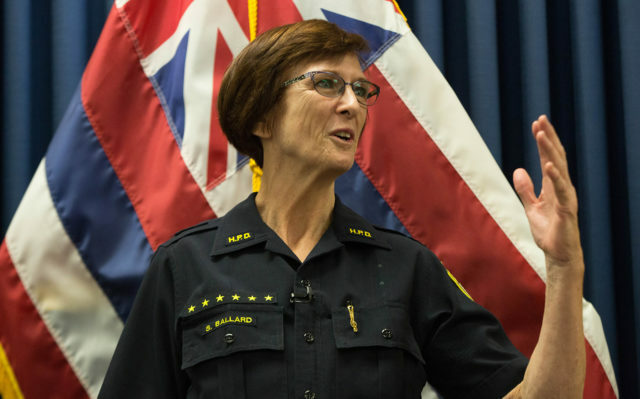 “I don’t think we could have picked a person more ideally suited to become the chief of the Honolulu Police Department at this time in its history than Sue Ballard,” Levinson said.